The different types of piles that are used in domestic building work, when and where these piles are used in foundations. Learn about the advantages and disadvantages of the types of piling that are used for constructing domestic buildings and homes, particularly Replacement and Displacement Piles. Types of pile explained simply so you can find out what are replacement and displacement piles, when and why should they be used and the factors affecting the use of piles in general. What are Piles and When Should they be Used? Pile foundations are a type of deep foundation that need to be used if the load bearing capacity of the surface strata (soil, earth etc….) is poor. 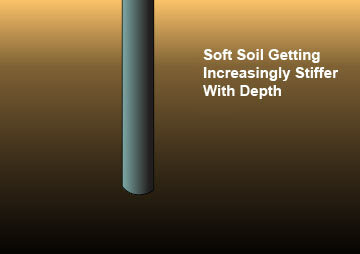 Foundations are typically considered deep when they need to extend beyond 3m below the finished ground level. As a point of note, deep foundations differ from shallow foundations which include strip foundations, pad foundations and raft foundations. Piles are generally used to spread the load of a building through soft and/or unstable ground, to firmer ground further down. Piles are usually made of concrete, either precast or poured in-situ on site. In domestic housing situations the concrete or steel piles are joined at the top with a reinforced concrete beam, commonly called a ring beam. 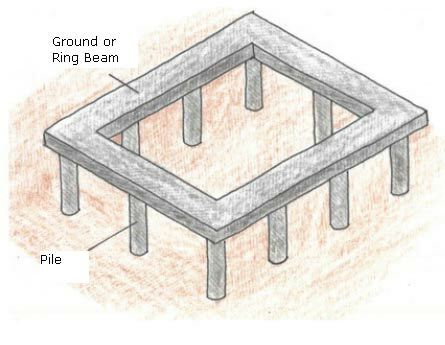 The ring beam sits on top of the piles and allows the superstructure, I.E. Brickwork and/or Blockwork to be built or stabilised. Piled Foundations are used for either economic or structural reasons, when it is necessary to transfer the load to a deeper more stable area of ground. 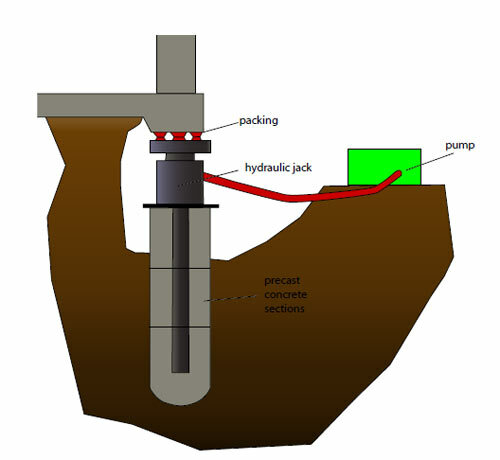 When the load cannot be supported by shallow foundations then piles can be used. They are also used to anchor structures that are likely to be lifted or pushed over, such as chimneys and other tall constructions. Piles are needed where the lateral force on the building needs to be anchored to stop the building falling over sideways. Replacement piles: These are piles which are put into holes dug or augured out of the earth. The concrete, or steel, simply replaces the earth, clay etc…. which has been excavated. Displacement piles: These are precast or pre-formed piles which are driven into the ground by a huge piling hammer. These displace the earth they are driven through. When choosing a piling system for foundation use there are 4 main things to base a decision on. Piling is being used more often these days than in past years. This is largely because of the huge increases in cost of carting away the many tonnes of soil required for a normal strip or raft foundation. The closer together piles are placed, the less the diameter of each pile needs to be and in some cases, especially in situations where a lot of subsidence has occurred, piles can be drilled through existing floor slabs to stop them sinking any further. This type of piling is called mini piling. Micro piles, usually even smaller diameters, are used where access is very much restricted. Piles can also be used when underpinning a property that may be suffering from subsidence issues or other issues that have caused instability. There are a number of different piles that are used in different circumstances. Which is used will depend of the ground conditions at all levels and the type of the structure to be supported. These are piles that transfer the load of the building through the soft, compressible strata or soil at the surface to the harder bedrock below it. With end bearing piles the stability of the foundations is achieved by creating a secure footing into the solid, uncompressible strata, which is usually the bedrock under the loose soil. These are very common types of pile, and generally the most easily understood. Where is in not possible, either economically or physically to use an end bearing pile, another alternative can be used; a friction pile. There are two forces at work here – As the pile is driven into deeper soil, the soil is compacted and offers great strength which offers some of the end bearing, load carrying capacity of the straight forward end bearing pile. However, this alone is not enough. There is extra load bearing capacity derived from the friction of the pile in the soil that it is in contact with – much like a nail driven into a piece of wood that becomes more secure and held fast the further that it is driven in. These are piles that are designed to offer stability against settlement and subsidence. They are generally used in conjunction with other foundation types, such as the raft foundation, to offer more stability. 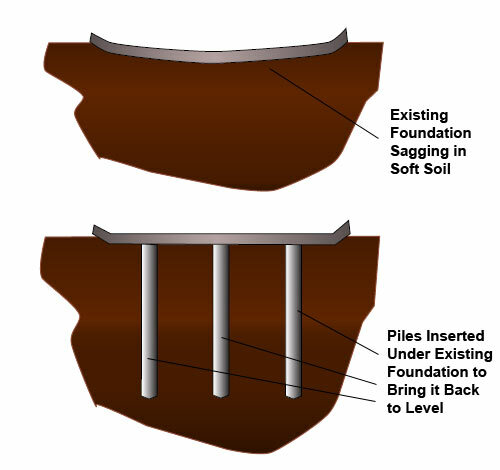 They reduce the sagging effect in the centre of foundations by reinforcing the soil below and creating leverage which counters the sagging movement. These are piles that are used to provide stability to tall structures by anchoring them firmly into the ground. The pile will counter act the lateral forces that the building will experience from such forces as wind etc…. For structures that will be over water (such as jetties, piers, and wharfs) driven displacement piles are the best solution. When it comes to using them on land there are other considerations to take in to account. Displacement piles are generally the most cost effective but cannot always be used as driving them in will cause vibrations that will affect surrounding buildings. In these situations bored replacement piles are typically used. For large structures, where large diameter piles are going to be needed, it is often cheaper to bore the piles into place. When piles are required for existing structures then jack piles are generally used. These are piles which are inserted by excavating the existing foundations and then adding sections of the pile under the building that are then pushed down into place using powerful jacks that drive each section into the ground. These are general guidelines followed by professional in the construction industry that are required for pile foundations. The foundations should be designed in accordance to the Eurocodes, especially BS EN 1997-1 and specifically for the design of concrete structures BS EN1992-1-1. When making piles, the concrete needs to adhere to BS 8500-1. More information can be found in the BRE Special Digest SD1 which can be purchased from the Buildings Research Establishment: projects.bre.co.uk/sd1/wheretobuy.html. Designing and constructing piles is a specialist task that involves a great deal of knowledge in ground types, material types, load calculations etc…. so we would always recommend that you consult with a structural engineer or piling specialist.